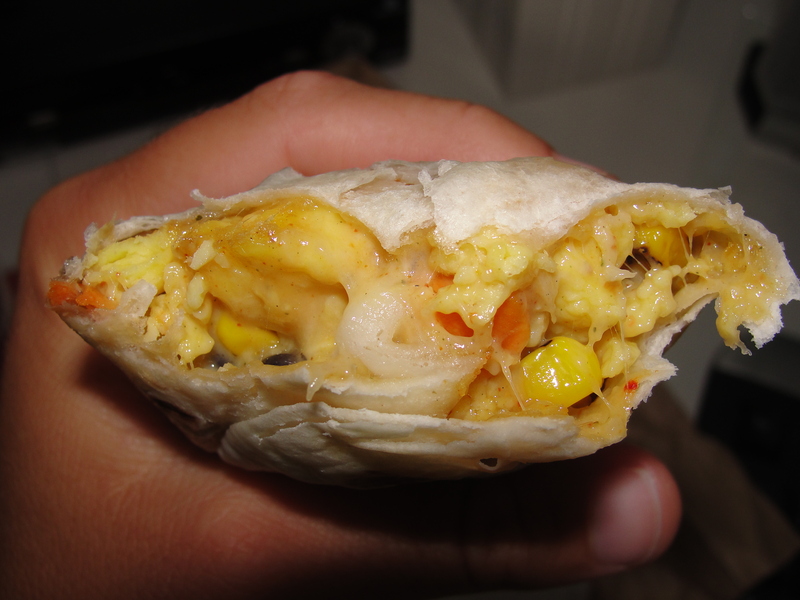 The concept of a Breakfast Burrito, is a pretty awesome thing. Load up some scrambled eggs, veggies, cheese and protein of choice, and you are set to go. Not only do you get to enjoy all of this wrapped in a lovely tortilla but, you also get pretty full and ready to go for the day. How often do I eat Breakfast Burritos? Eh, maybe 4 times a year. Yet, I love them. While I am normally stuck with oatmeal for breakfast, every so often I treat myself to a Chick-fil-A Chicken Burrito and am in heaven. 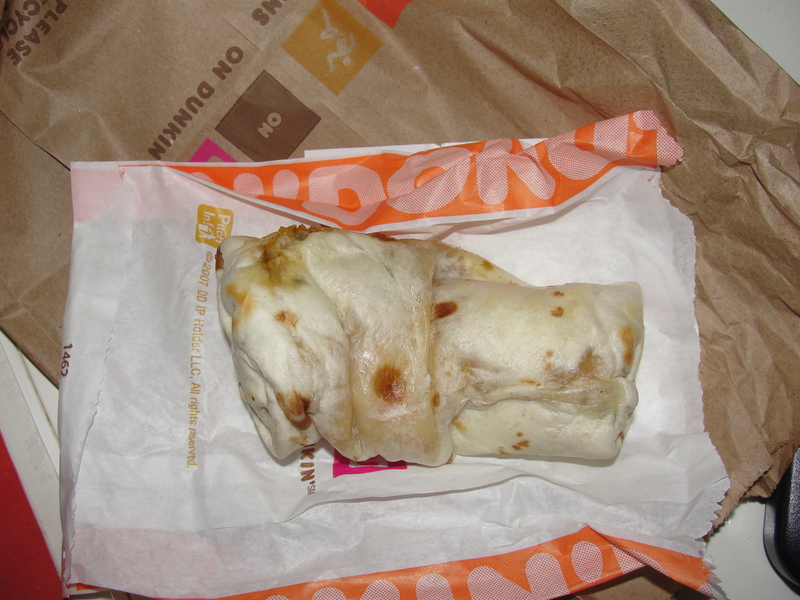 A few months back, Dunkin Donuts introduced 2 of their own breakfast burritos – one steak and one veggie. I was pretty excited about the veggie burrito. Finally, after waiting a while, I went and got myself one. While it was no Chick-fil-A, it was at least One Funky Burrito. It was a Sunday morning when I ordered this from Dunkin Donuts and waited until I got home to eat it. When I opened it up, I was presented with a Funky looking breakfast burrito. Even though my bag was laying flat in the car, this sucker looked like it had just gone through the ringer. It was still pretty hot when I opened it up so, I gave it a few minutes to cool. It was pretty small in size and the tortilla felt like a lighter variety than what it used at the CFA. After waiting for what seemed like ages, I finally dug into this breakfast burrito. After my first few bites, I was really not tasting too many flavors. I could see the eggs, cheese, potatoes and some veggies but, there was really no flavor to any of it. I found the tortilla to be very lacking and flavor and quite chewy – CFA wins in this area. 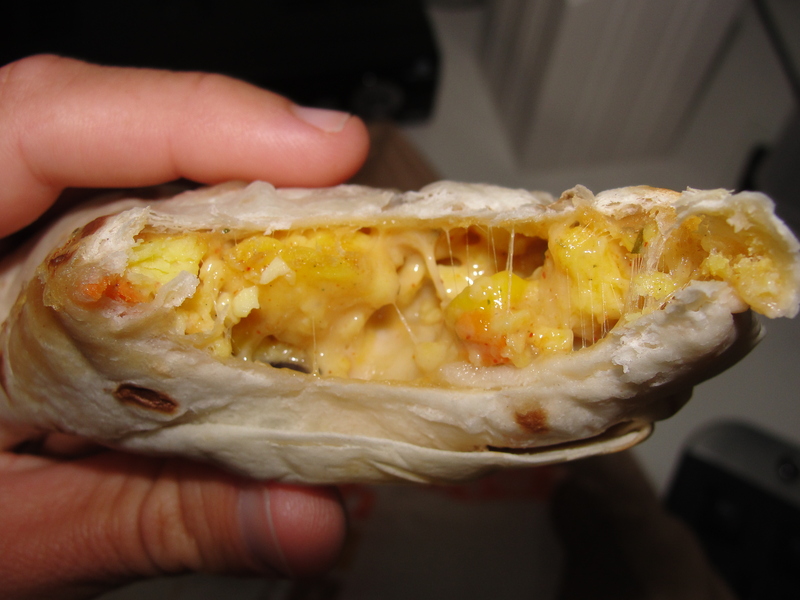 I really do not like scrambled eggs on their own, and can only eat them within a burrito. These eggs had no flavor whatsoever yet, they were warm and the consistency was good. I could see plenty of melted cheese but, I could not tell you what variety of cheese it was at all – it just tasted like your usual fast food cheese. As for the potatoes and veggie pieces, they were very soft and also lacking in flavor. I was feeling like I was in the twilight zone…so many elements and yet no flavor? I didn’t find the black beans from the burrito until the last 3 bites or so. The beans were just typical black beans but, once again really didn’t have too much flavor. There consistency was good and I did like how they mixed with the other components of the burrito. Now, if all of the components had some flavor to them, I know I would have liked it even more. Also towards the end of the burrito, I found some tomatoes and a green vegetable. I’m really not sure what green vegetable I found because, guess what, no flavor. As for the tomatoes, they were a bit well done and really didn’t add much. I finished the burrito and found myself to not really be overly full. Usually, I eat a CFA burrito and I am good until dinner. So was not the case with this sucker. Overall, I think I would really have no reason to get this burrito again. For the amount of calories, I would have expected it to fill me up more and at least have some flavor. Grilling the veggies (like CFA does), and making the cheese more of a dominate flavor, would have helped this burrito tremendously. I really do appreciate that Dunkin came out with a meat-less burrito and I am glad that I tried it. In the end, I just would rather go on a sugar binge with Chocolate and Sprinkle Munchkins when I decide to do the Dunkin. 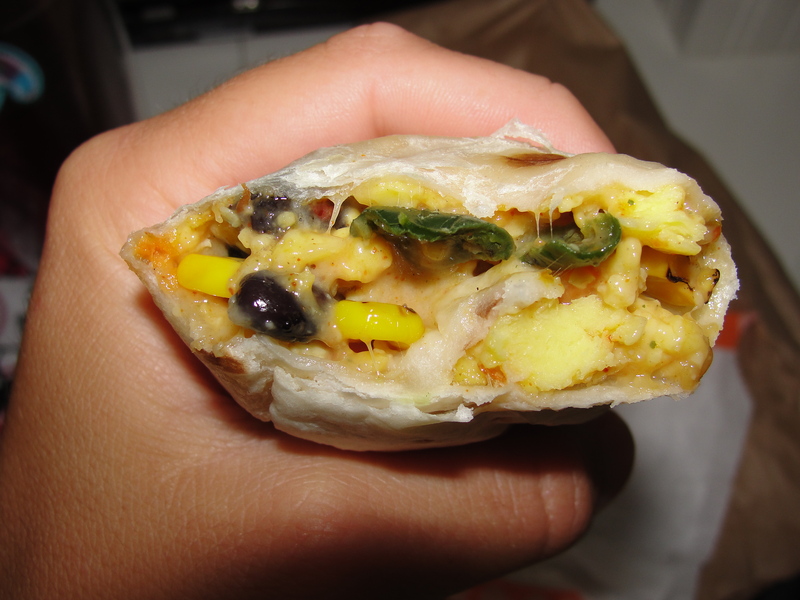 From first glance to last bite, this veggie breakfast burrito from Dunkin Donuts, was One Funky Burrito.